Since I’m tasting alternative whiskeys to bourbon, I thought I’d continue with a small batch wheat whiskey from Heaven Hill, produced at the Bernheim Distillery. 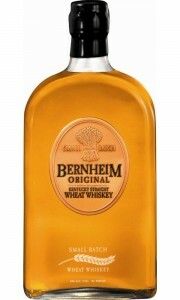 Being a straight wheat whiskey means that Bernheim Original is distilled from a mash of at least 51% wheat and aged for at least 2 years in new charred oak barrels. Prices range up to the high twenties, but I can find store selections for $20 for the past year or so. The nose reveals that there’s got to still be a pretty good corn component. I smell caramel, straw, sweet corn, sweet tobacco and dark cherries amidst a mild alcohol burn. A drop of water accents the tobacco a bit. 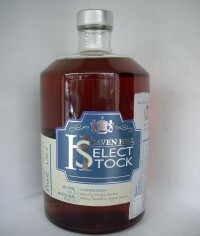 The taste is of vanilla, caramel, straw, honey, candied cherries, ginger, plum and pear. The finish lingers nicely and is fairly spicy with black pepper and ginger and has a leathery feel that fades reasonably quickly. After adding just a drop of water, the whiskey takes on a sweeter profile with less spice on the finish. The only new flavor I detect is lemon drop, but the flavors blend together more than before and the leathery mouthfeel and mild wood on the finish remain. This isn’t a very complex whiskey, but it’s a solid one with a nice mouthfeel and a good balance of fruit, candy and spice flavors to make things interesting, while finishing with enough wood presence to show some age. I also like the fact that it gives me a bit of insight into wheated bourbons, by showcasing the wheat a bit more. This is a regular bottle, but I have a store selection that I’ll taste at some point in the not-too-distant future for comparison. At $20, you can’t go wrong by trying it out, but it’s worth the experience even at $28. Posted in Whiskey. Tagged Heaven Hill, Wheat. I received another request from Cap’n Jimbo for a review of a bargain whiskey, so I stopped in at Total Wine & More and picked up a bottle of Heaven Hill’s Mellow Corn for $10.49+tax… definitely a bargain price. Being a bonded whiskey (or bottled in bond) means that it’s aged at least 4 years and bottled at 50% ABV. Isn’t corn whiskey called bourbon, you say? Actually, here is a good explanation of the differences, but I’ll highlight them for brevity. Bourbon is distilled from a mash of at least 51% corn, while corn whiskey is at least 80% corn in the mash. Bourbon is also aged in charred new oak barrels, while corn whiskey is aged in un-charred new oak or used oak barrels. That’s the law! 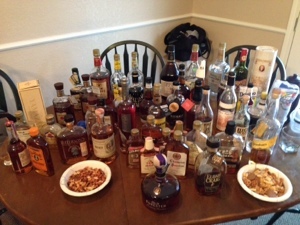 So, on to the whiskey…. The nose is a bit hot with a definite corn aroma… corn husk, sweet corn as well as caramel, honey and mild tobacco. 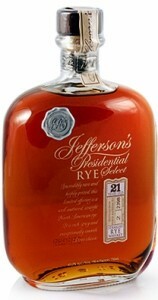 It’s not very different from some bourbons that I’ve had and water doesn’t seem to change things much. The taste is initially sweet, then transitions to a slightly woody and peppery finish. Making a brief appearance after the initial sweetness are caramel, honey, fresh cut grass and a bit of cigar box in the background that’s hard to pick out initially, but is more apparent after a while. The finish is slightly bitter, tannic, leathery and starchy along with the aforementioned spiciness. The finish lasts a while, but the lingering components are mostly starch and wood. A drop of water subdues the flavors a bit and kind of muddles them together, but they last a bit longer. The finish becomes less starchy, but the bitterness and woodiness remains with a bit more spice than before. More water makes the flavors retreat, but the spicy and starchy finish remains leaving what some might call a mildly harsh whiskey. It’s not bad, but it’s no winner either. If I were looking for a whiskey around $10, I would buy a bottle of Evan Williams White Label Kentucky Straight Bourbon (also bottled in bond). It’s usually $11-12 and is a much better whiskey than Mellow Corn. Another option is Tom Moore Bottled-in-Bond Bourbon (only 1.75l here) at about $20, which amounts to a lower price per ounce, or Old Grand Dad Bottled in Bond (haven’t had this one, so I’m just basing this on recommendations from others). If you’re willing to spend a bit more, then try Old Grand Dad 114 for less than $20… it’s quite good. If corn whisky is really what you’re looking for, then the next best alternative that I know of is Balcones Baby Blue for about $45… not exactly a bargain, though. Posted in Whiskey. Tagged Corn, Heaven Hill. A very generous friend shared a pour of this rare whiskey with me today. 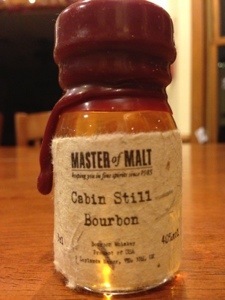 It’s an 11 Year Old whiskey with notes of cocoa and tobacco with an evident wood character. That’s about all of the detail that I could get in the brief tasting, but it was generally impressive with good chewy mouth feel and only moderate burn at 127.4°. I wish that I could spend more time with this one or any of the other older editions from this collection. I have a bottle of the 6th Edition Blend of Mashbills (batch #4) and passed on the 7th Edition Promise of Hope, which is still available. Posted in Whiskey. Tagged Bourbon, Heaven Hill. I’m two days late on this one. I need to catch up quickly in order to have any hope of finishing on time. This bottom shelf bourbon has a very weak nose of caramel and alfalfa. There’s a bit of syrupy texture from sweet corn and grass to mostly grass with lots of oak and sorghum. The finish is mostly the peppery burn of alcohol accompanied by leathery dried raisin and I still taste grass with lingering oak. I wouldn’t spend the $11 even if it were available here. An old-fashioned style of bourbon, Cabin Still is a sour mash whiskey from the Heaven Hill distillery.